Home / animation / CP / trailers / video / Meet Snowball in Second 'The Secret Life of Pets' Trailer. Meet Snowball in Second 'The Secret Life of Pets' Trailer. Who would have thought a couple of years ago that Illumination Entertainment would have the biggest grossing animated film of 2015? Not only that but Minions is now sitting at the number two spot in the biggest grossing animated movie of all time list. Can they succeed without those dinky yellow money-printing machines though? 2016's The Secret Life Of Pets is set to answer that question. The first teaser trailer was cute and funny, giving us a look at what our pets get up to when we're not around. The freshly released second trailer actually gives us a more detailed look at where the film is ultimately headed. 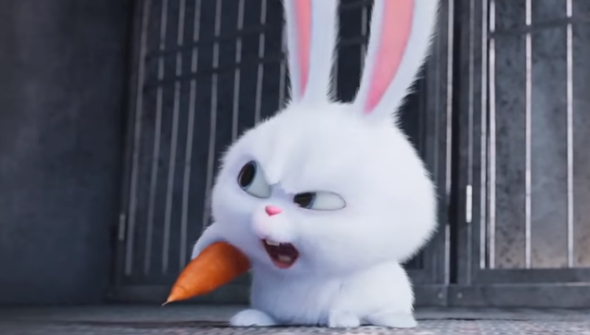 Taking centre stage this time is the film's antagonist, a cute yet malevolent bunny named Snowball, voiced by comedian and actor Kevin Hart. Snowball's plan to 'liberate' all pets from their owners is set to be the film's focus, taking it far away from the first trailer's location of a single apartment block. Illumination clearly know what they're doing here, giving viewers a whole cast full of highly merchandisable fuzzy critters. Whether they'll be as popular as the Minions though, who can say? The animation itself looks pretty appealing but this closer look at the film seems to have lost the simple charm of the first trailer. The humour here is not exactly what you'd call subtle. The biggest question mark, however, is hanging over Snowball, as Hart's style seems to be something of an acquired taste. With that said, he's definitely one of the biggest names in comedy right now, so that isn't going to hurt the film's chances. The Secret Life of Pets will be released on June 24th in the UK and July 8th in the States, Check out the trailer below.